Our lead artist finally had some time to work on the official logo of the game and it is awesome! We will be using this logo from now on instead of the pink skull we have been using so far. Picture 1: The new logo! As you can see the logo follows Mayan theme with the story and the first arena. The victory screen was show last time, and now we have finished our Draw screen as well. Originally we thought that draws would not be that common because of high amount of points scored in the game, but testing has proved otherwise. When players are equally matched, the games are really tight and can often end up in a draw. For awhile we were debating should we have the characters still fighting in the draw screen or have them both exhausted and spent. The game is very hectic and characters die repeatably so we decided to have them both down. Programming part of the second arena is almost finished already and Aleksi is really getting hang of using Unity engine. All the hazards and basic mechanics have been done and now are waiting for cool graphics. On a graphical side our artists are moving forward in a steady pace and the second arena is forming around the sketches that we made earlier. 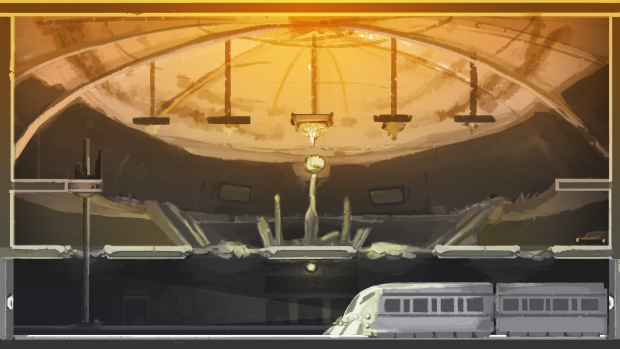 Picture above is the final concept of the second arena and at the moment artists are making the actual level based on this concept art. You can see how well they have captured the feel of the picture once the level is finished.